Tomorrow we are leaving for Duluth. It is only 1 day and some 8 hours until race time. I know this because of grandmasmarathon.com's helpful ticker, as if I'm not starting to freak out already! In addition to the mental game that I'm starting to strengthen, we also have to deal with physically getting there! 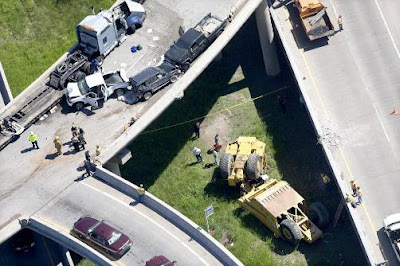 Normally on a gorgeous summer weekend we would experience traffic, compound that by how many participants will be making the same treck and add in a dash of a traffic accident that damaged I-35 and you've got a mess folks. A freaking earth scraping vehicle fell of it's trailer! And now, while I'm complaining, I want to point out that there were mutliple vehicles involved in the following accident, and in all seriousness it could have been worse . . . but now already bad traffic will be cut down to one lane! Craziness! So . . . yeah. I'm freaking out and I have mosquito bites all over my legs, which are driving me crazy now . . . which means they'll be even worse while running! So those are my random thoughts while I'm contemplating sure doom and wondering who the heck made us sign up for this silly thing! I'm so excited for you! I know you're going to do sooo well!! Can't wait to hear all about it! Good luck!! I'm sure you'll do awesome!